Frs. Michael, David, and Thomas Woost are three of seven brothers, born to Carl and Norine Woost. Fr. Mike, ordained in 1984, has served as the parochial vicar of Immaculate Conception Parish in Madison, as the Co-Director of the Diocesan Vocation Office, and since January of 2000, as a faculty member of Saint Mary Seminary where he teaches courses on sacramental and liturgical theology. Fr. Dave, ordained in 1991, has served as the parochial vicar of Saint John Neumann Parish in Strongsville and Saint Peter Parish in Lorain, as the chaplain of Lake Catholic High School, as the presbyteral moderator of Saint Philip Neri Parish in Cleveland, and, since August of 2004, as the pastor of Divine Word Parish in Kirtland. Fr. 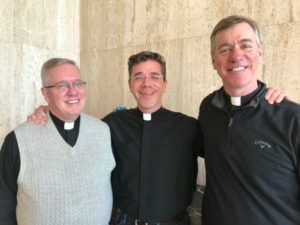 Tom, ordained in 1997, has served as the parochial vicar of Immaculate Heart of Mary Parish in Cuyahoga Falls, Saint Anthony of Padua Parish in Parma, and Saint Leo the Great Parish in Cleveland, and, since January of 2008, as the pastor of Saint Brendan Parish in North Olmsted. ONLINE REGISTRATION IS CLOSED FOR THIS EVENT. PLEASE CALL OUR OFFICE AT 216-589-9852 TO CONFIRM AVAILABILITY. Reservation Policy – All attendees must register in advance. If you reserve and are unable to attend, please call the office (216-589-9852) to cancel by noon 06/25/18 to avoid a charge for the event. This entry was posted in past events on May 24, 2018 by suejosecretary.